[Breathe, breathe] That’s me trying not to panic that it’s already the 12th December! Where is time going at the moment? Phew! It’s racing by. 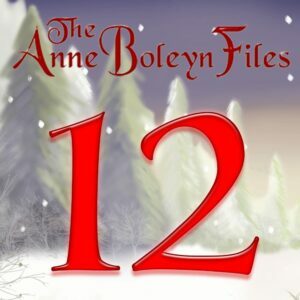 The good news, though, is that it’s time for another Anne Boleyn Files Advent Calendar treat! Today’s has been contributed by historical novelist Alex Marchant – thank you, Alex! – and it takes us just a smidgen earlier than the Tudors. I do hope you enjoy it. To enjoy today’s treat and any that you have missed, simply click on the number 12 here or scroll to the top of this website and click on the Advent Calendar link there- easy and calorie-free! Oh, Claire, I’ll be joining the Tudor Society soon! It took some negotiating (My birthday isn’t til July), but it will work out for me. :). Thanks again! Wow, what a fun read. And so interesting from the point of view of someone at the end of Richard’s reign. I will definitely check out her book. Thank you Alex. Many thanks Michael – and I hope you enjoy the books if you do buy them! Thanks Alex for sharing this wonderful exert with us from your books, an insight to days gone by. The festival of Twelfth Night really did get the ordinary people excited as they came into the Lord’s Hall and the Lord of Misrule caused fun and sometimes chaos and everyone had a raucous time. Christmas 1484 of course had the former Princesses Elizabeth and Cecily at Court having emerged from Sanctuary at Westminster some months earlier. Crowland tells us the music was very loud and it was a good time, but the author also criticised the reception of the oldest, Elizabeth, causing ridiculous rumours later on. Queen Anne was only a few years older than eighteen years old Elizabeth, now a beautiful young woman. The two ladies dressed alike in sumptuous but identical robes and Anne more or less took her under her wing. They appeared together in various pageants and had a really good time. However, the Chronicle remarked that Richard dressed them alike and rumours saw more to this than the normal honour of matching dresses. It has to be remembered that these Chronicles were altered to please the Tudors in 1486. However, we still get a flavour of the music and dancing and fun had by all. Anne Neville became ill some time in the New Year, although she may have been ill before hand and she went into decline. It is with hindsight that these monks wrote with disapproval of the matching outfits although Anne in fact was showing great honour to the young ex Princess, welcoming her and treating her as one of the family. The music was loud, the dancing wild, the celebrations full on and everyone enjoyed themselves. Thanks for the link, Alex, I will check it out. i bet it was quite rowdy what with all the ale but yes great fun, it certainly was a treat for the ordinary citizens. And of course, you can’t upset the neighbours as there’re all at the party lol. As you say, what a real treat!